One of the tasks you need to consider if you get lost or are injured and can not reach the trailhead, is a way to get attention of rescuers. Depending on the environment where you are stuck, you can signal for help in many different ways. It's a good idea to set up a few different ways, if you can. Be sure to set up your signals in the most visible place available to you so they can be seen from as many directions as possible. In some frontcountry hiking areas, cell phone reception is pretty good. The further from civilization you go, the less helpful a cell phone becomes. In the areas I hike, they seldom work so I've never taken one along. If you don't mind the extra ounces of weight and space used up in your pack, then it won't hurt to have one. It would sure be courteous to the rest of us if you left it turned off and only really used it for emergencies. I can't think of anything more annoying than hearing a ringtone down the trail while I'm soaking up some sun on a rest break along the trail. Another one that irked me last summer was being on top of an amazing mountain and having to listen to people calling home to say, "Hey, I'm on top of Mt. Whatever and it's amazing! Yadda, Yadda, Yadda, Blah, Blah, Blah, ..."
Personal Locator Beacon - simple one-way satellite device. Activate when you want to be rescued and then wait for the calvary to show up. Spot Messenger - a one-way satellite device with 'OK', 'Help', and '911' push buttons to send various messages. It can also track your path for folks back home to see. DeLorme InReach - a two-way satellite device similar to Spot but can send and receive text messages when coupled to your Android or Earthmate device. 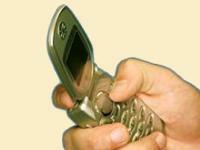 Cellphone - while hiking close to populated areas or travel ways, your cellphone will probably have coverage. Even out in the wilds, you may get a signal. On wide open, flatlands the cell coverage is better. Hike to the top of a ridge and your chances go up also. Satellite Phone - pretty much guaranteed two-way communication any place, any time. You can rent one for specific trips rather than purchase. In the United States, three of something signifies that help is needed. That could be three whistle blasts, three gun shots, three piles of dark wood on light sand, or three fires burning. The fires can be in a line or a triangle, but make sure they are pretty far apart and in an open area to be seen from overhead. If you are using a whistle, blow three distinct times and then wait 3 to 5 minutes and blow three blasts again. Continue to do this every 15 minutes or so. 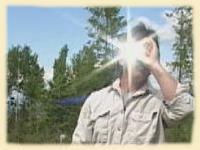 Reflecting the sun's light to distant places, such as an airplane or helicopter, can be very effective at getting attention. A mirror can reflect light miles across the open. If you can get to a high spot, you can spend time signaling to distant places on the horizon until you see an airplane flying. It's better to signal at a plane that is in the distance rather than one that is up above you since the pilot can't see straight down. There are specially made signaling mirrors with a hole in the center for sighting. But, any shiny surface can work - a compass, watch, knife blade, ... are all possibilities. Sight the reflection on the distant target and keep signaling it until you get a response, such as the plane dipping its wings or the helicopter circling overhead. Once you have your survival fire going, gather more wood into an open area and lay a large fire ready to be lit. Also, gather dry leaves, pine needles, moss, green pine boughs, and a bottle of water. This will be your signal fire and you want it to be pretty big and as smoky as possible. When you have enough wood and material to create smoke, light the fire. You may want to wait until morning if it is already dark for the evening - chances of a search party coming out at first light is greater. On windy days, smoke will dissipate quickly so early morning tends to be less windy than evening, too. 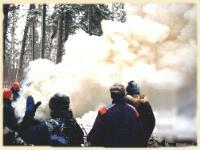 Get your fire burning and then add smoke materials to create a large column of smoke. As you experiment, you can figure out how much material to add to create smoke but not smother the fire too much. Creating a large puff of smoke periodically rather than burning all your materials right away may increase your chances of being seen. Good job also you might of added useing stones and/or large pieces of wood to write out HELP and do stay near the spot you are signaling from. I'm useing this to train Boy Scout leaders. I would also recommend Orion pocket rocket signaling flare kit Mfg. #749, which is small & light weight, and can shoot signal flare 300 ft. into the air. A Orion hand held smoke & flare kit, Mfg #536, which has smoke flare (for daytime locating)& red flare for nighttime locating.